Go to Dashboard > Calendar tab, and select "Day" view. Select the date for which appointment has to be booked from the calendar icon on top. The calendar will show the list of providers column-wise. 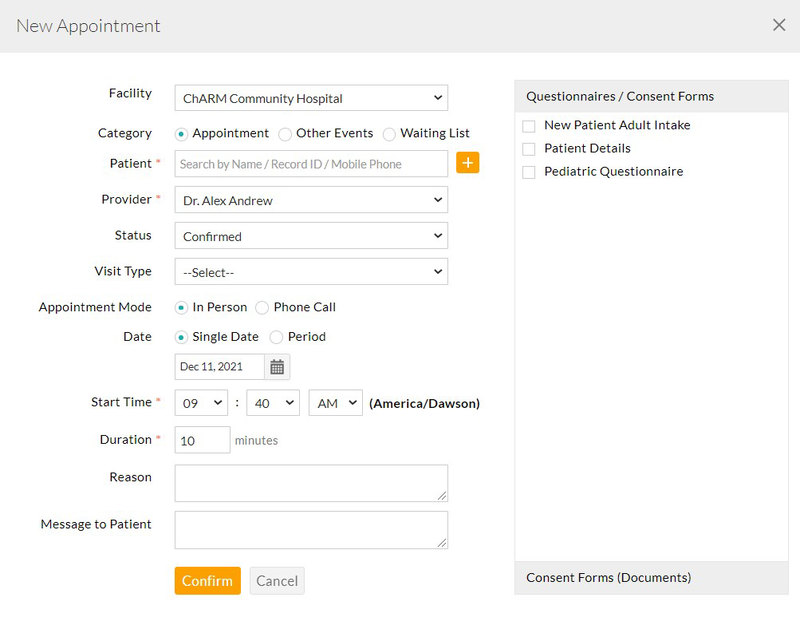 Click on the empty "Time Slot" against the provider with whom appointment is needed. Select the patient by searching the Name (or) Record Id. If the patient is new to the practice, use the "New Patient" link to add them to your practice. Choose the "Visit Type". Choosing the "Visit Type" automatically sets the duration for the appointment as per the pre-configured settings. If the appointment is needed over a time period, then set the "Date" option to "Period" and choose the dates. Enter the "Reason" for the appointment. Enter the "Message to Patient", if you wish to give any instructions to the patient. You can optionally choose the consent forms and pre-appointment questionnaires that needs to be filled by the patient from his Patient Portal login (or) Kiosk. Click on "Confirm" to book the appointment.